The Tongva language (also known as Gabrieliño) is a Uto-Aztecan language formerly spoken by the Tongva, a Native American people who live in and around Los Angeles, California. Tongva is closely related to Serrano. The last fluent native speakers of Tongva lived in the early 20th century. The language is primarily documented in the unpublished field notes of John Peabody Harrington made during that time. The "J.P. Harrington Project", developed by the Smithsonian through UC Davis, approximately 6,000 pages of his notes on the Tongva language, were coded for documentation by a Tongva member, who took 3 years to accomplish the task. Claims of native speakers of Tongva who have died as late as in the 1970s have not been verified as having been fluent speakers. Evidence of the language also survives in modern toponymy of Southern California, including Pacoima, Tujunga, Topanga, Azusa, Cahuenga in Cahuenga Pass and Cucamonga in Rancho Cucamonga. Additionally, the minor planet 50000 Quaoar was named after the Tongva creator god. As of 2012, members of the contemporary Tongva (Gabrieleño) tribal council are attempting to revive the language, by making use of written vocabularies, by comparison to better attested members of the Takic group to which Tongva belonged, and by offering classes. The Gabrieliño-Tongva Language Committee has created Tongva grammar lessons and songs, and a Tongva Facebook page "introduces an audio of a new word, phrase or song daily." 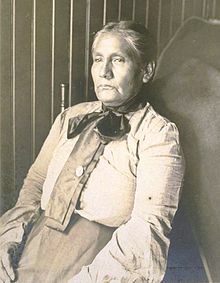 Mrs. James Rosemeyre (née Narcisa Higuera), photographed here in 1905, was one of the last fluent Tongva speakers. An informant for the ethnographer C. Hart Merriam, she was the source of the widely used endonym Tongva. The following is a list of the consonants and vowels of the Tongva language as used by the Tongva Language Committee, based on linguist Pamela Munro's interpretation of the fieldnotes of J. P. Harrington. In parentheses is the spelling of the specific sound. Note that there are multiple orthographies for the Tongva language. Consonants /b d f ɡ/ are used in loanwords. Tongva is an agglutinative language, where words use suffixes and multiple morphemes for a variety of purposes. The Lord's Prayer is called 'Eyoonak in Tongva. The following text was derived from old Mission records. Taylor claims "they do not count farther than ten"
Tujunga = from the root word old woman tux'uu Tujunga means Mountains of Health according to long-time residents. The table below gives the names of various missions in the Tongva language. ^ Hammarström, Harald; Forkel, Robert; Haspelmath, Martin, eds. (2017). "Tongva". Glottolog 3.0. Jena, Germany: Max Planck Institute for the Science of Human History. ^ Byrd, Deborah (19 February 2013). "Quaoar, a rocky world orbiting beyond Neptune". EarthSky. Retrieved 31 August 2014. ^ R. Plesset (2012-06-01). "San Pedro: Science Center Endangered/Tongva Village Site Revitalization". Indymedia Los Angeles. Retrieved 2012-08-26. ^ Marquez, Letisia (2014-07-01). "Social media used to revive extinct language". Phys.org. Retrieved 2014-07-03. ^ Lepowsky, M. (2004). "Indian revolts and cargo cults: Ritual violence and revitalization in California and New Guinea". In Harkin, M. E. (ed.). Reassessing revitalization movements: Perspectives from North America and the Pacific Island. Lincoln, NE: University of Nebraska Press. pp. 1–61. ISBN 9780803224063. Retrieved 19 August 2013. Gabrielino language — overview at the Survey of California and Other Indian Languages. The Limu Project — active in Native California languages revitalization. 2002 Tongva speech spoken at Cal Poly Pomona during the opening of a Tongva ethnobotanic garden; speech begins at 35:10. This page was last edited on 3 February 2019, at 01:43 (UTC).